A woman thought she had broken one of the world’s greatest secrets when she videoed an artist near Israel and claimed it was the elusive Banksy. 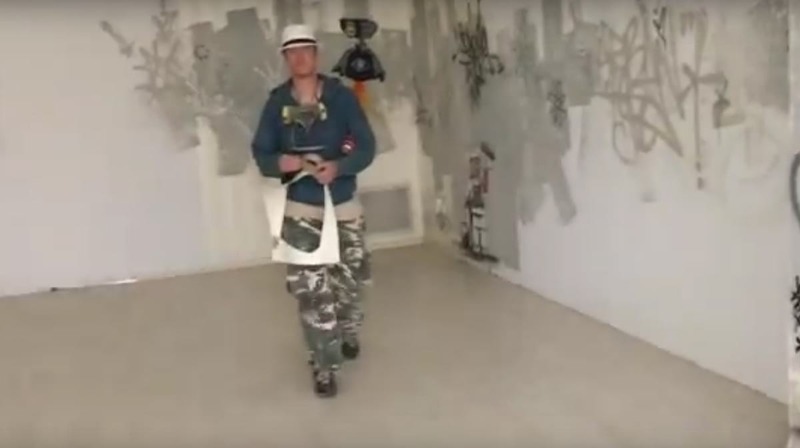 The footage, taken days before the famous graffiti artist opened an exhibition in Bethlehem, spread over the internet showing a man donning a fedora. As the video was taken in an art show curated by Banksy’s former manager, many believed it had to be him, but alas it turned out to be British-Israeli artist AME72. It wasn’t long before some of AME72’s fans identified him in the video and pointed out that the art work features his trademark Lego Man. James Ame (AME72) describes his art as a ‘mix of urban, contemporary and pop art’ and claims to have a following that includes royalty. No doubt that James Ame will be a bit disappointed that his big break into the media is when he was mistaken for another artist. Any publicity is good publicity I guess. Banksy’s identity stays a mystery for now, and he remains one of the highest paid living artists in the world. I wonder if we put a face to the art, it would take away the allure.